Each Event Date & Time has it's own detail pages with tabs & buttons. From the Event Type, Dates & Times tab, click any date link to go to the specific date's details. Use the Summary tab fields to add details specific to this Event Date, including a To Do List and Instructors. Be sure to Save Changes. View the Event Date's Enrollment by clicking the Enrollment tab. 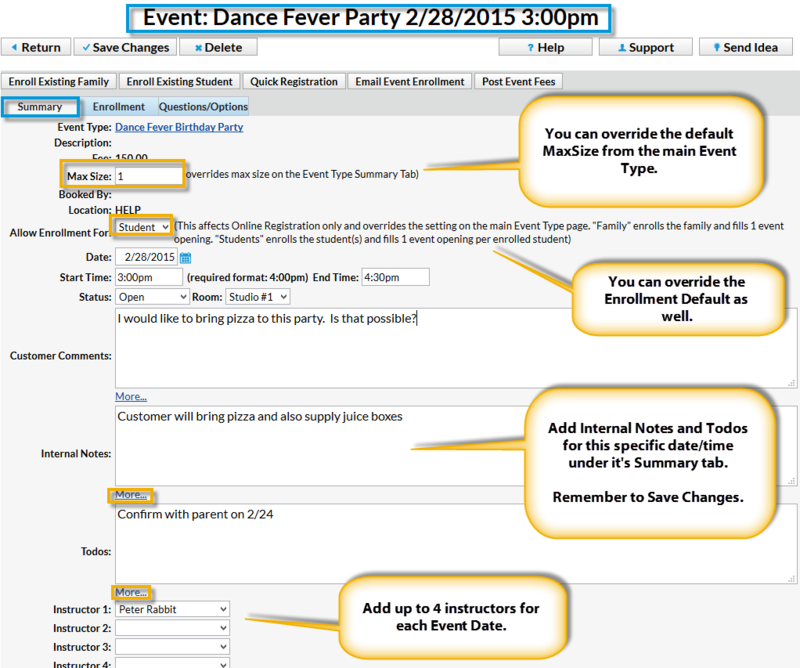 View submitted answers to your Event Type Questions by clicking the Questions/Options tab. Click the Email Event Enrollment button to send an email to the Event enrollee(s). Click Post Event Fees to post fees to the enrollee(s) at one time. Note: Do not use this option if you've set Post Event Fee on Reg? to Student or Family on the Event Type Summary page as this will cause duplicate fee postings. Click the Enroll Existing Family, Enroll Existing Student, or Quick Registration buttons to enroll to this Event Date. For more details on event enrollment, see Register / Enroll in an Event.